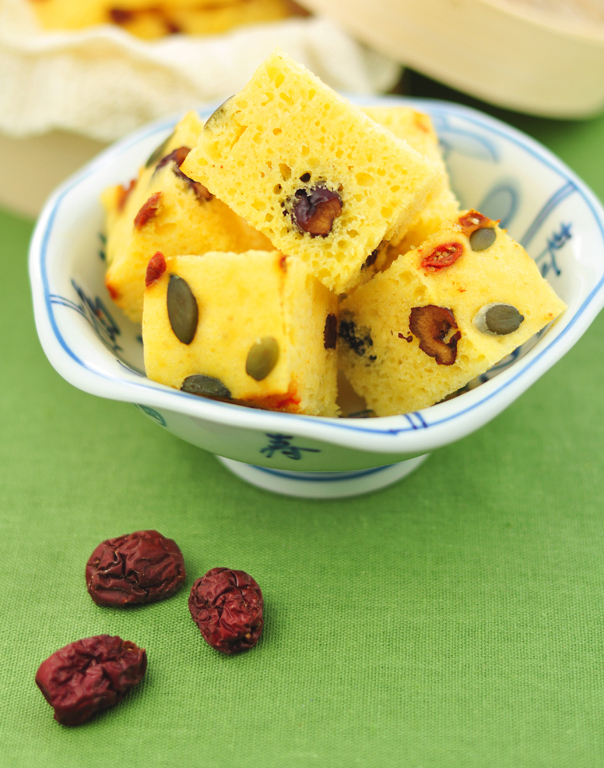 Fortune cake (commonly known as “fa gao”) is a traditional treat made with flour as its main ingredient. 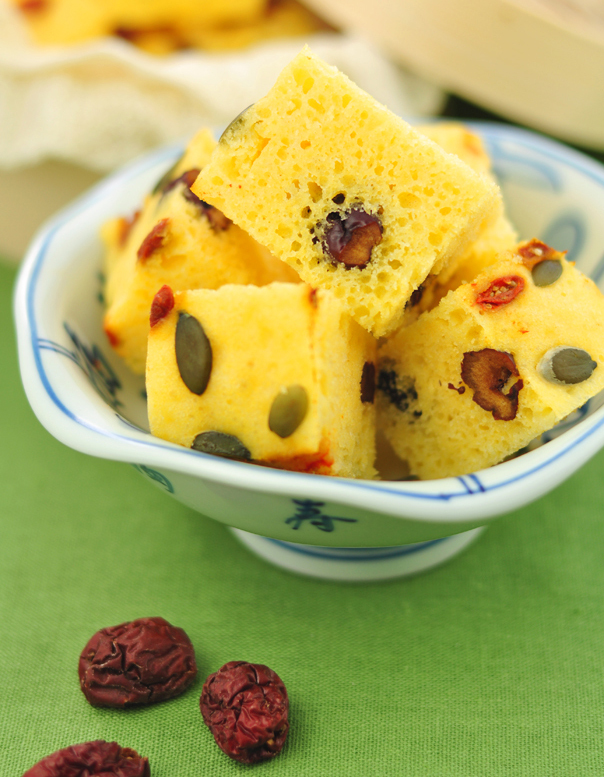 It is a popular cake that is widely distributed in Northern and Southern China. It smells fantastic and is very nutritious, especially for the elderly and children. 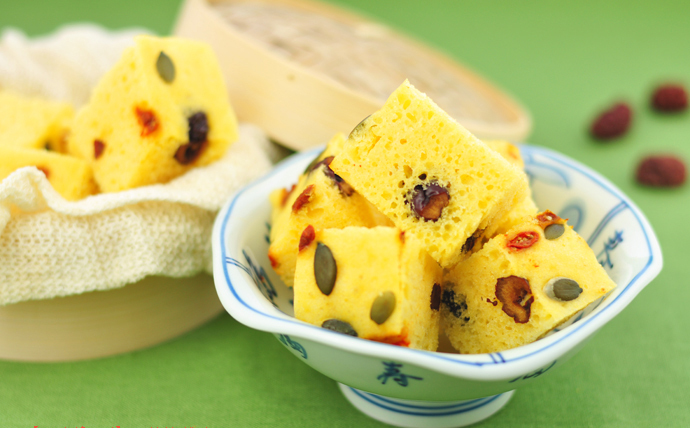 Today, I share a traditional recipe that is called fa gao. In China, it means “raised prosperity”. So everyone loves fa gao! When it is Chinese new year, many people will make fa gao, which is a golden color. It is one of the most favorable New Year cakes. Eating it steaming fresh is the best way to enjoy this soft and sweet treat! When my family comes together on New Years to gather around a fresh bowl of fa gao, we wish each other good fortune and wealth for the upcoming year. Even though I don’t believe in luck, I really do love the taste of fa gao. Step 1. 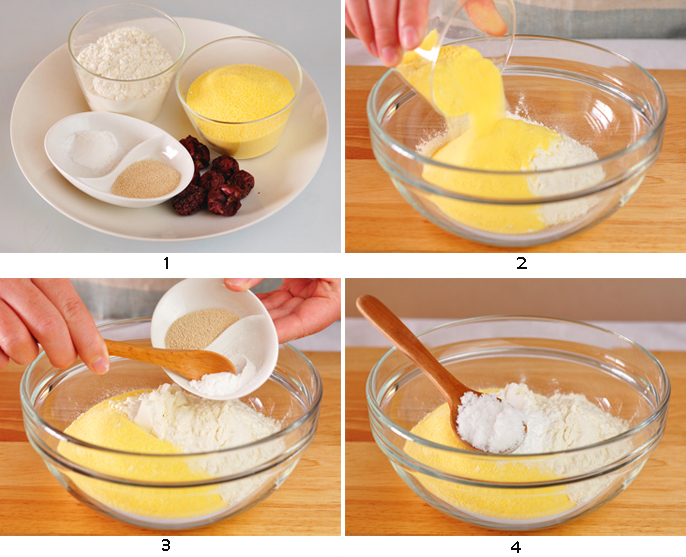 Measure all of the ingredients, including corn flour and high-gluten flour ratio of 1:1. Dry yeast is removed from the package before use. Step 2. Pour all the corn flour and high-gluten flour in a clean, large container. Step 3. Add baking powder. Step 4. Add the amount of sugar you decided on, 20-40g. If there is an elderly person at home, it is recommended that the amount of sugar used is the minimum of 20g; the standard amount is 35-40g. Step 5. Stir the above materials. Step 6. Test the temperature of the water by hand(it is close to body temperature) or thermometer if you have one. Add dry yeast to the water and mix until dissolved, this will activate the yeast. Step 8. Stir the batter into a paste. Use a pair of chopsticks to stir. The batter will adhere to them without falling off. Step 9. A thin layer of oil is applied to the mold with a pastry brush. Step 10. Pour batter and add evenly dried red dates. Cover with a lid or a damp cloth and leave it in a warm place. Step 11. A good batter will increase to twice the original size. Sprinkle the wolfberry(goji berry) and pumpkin seeds on the surface. Step 12. Put it in a steamer and steam over it for 40 minutes. Cut, and enjoy! 1. 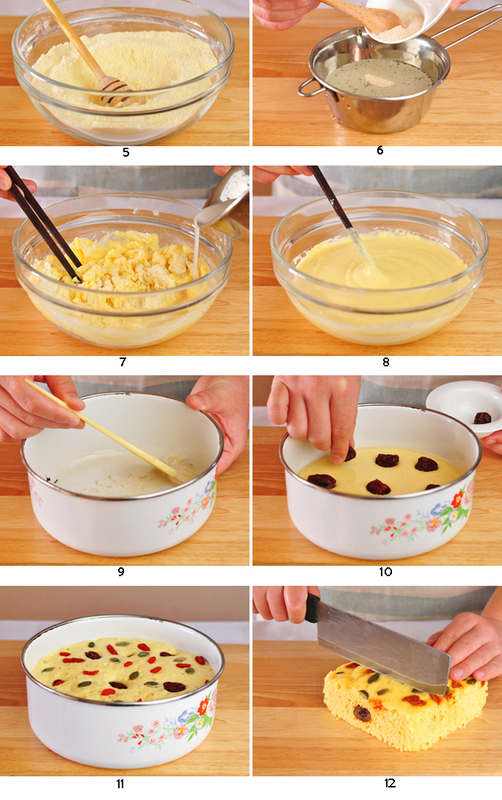 Add dried red dates: mainly according to personal preference, if you like to eat your cake with the dates towards the middle of your cake, add them like in Step 10; if you like to eat your dates on top with the other added goodies, add them like in Step 11. 2. There should be enough water in the steamer: Because the cake is steamed directly in the container, it needs to be steamed for 40 minutes in order to be cooked. For a long time, sufficient water should be poured into the steamer to avoid your steamer from drying out and the cake sticking. 3. Learning this dish, the method can also be used to create other treats. In addition to today’s flour fortune cake, everyone can also use the same method to create purple potato cake, sweet potato cake. These also taste delicious! Oh wow what a wonderful looking and sounding treat, perfect with a cup of tea. Your recipes are fantastic. Do you have a recipe book? Thank you. Thank you very much, but I didn’t write a cookbook myself, if you like, you can check some of the Chinese cookbooks here.